“It is our responsibility to give you the time of your life and the best show you’ve ever seen.” Brent Smith told the nearly full-house on Thursday night when Shinedown played the Talking Stick Arena in Downtown Phoenix. They certainly didn’t disappoint. The show was spectacular, that’s for sure. Openers Sixx: A.M. kicked off the night with a bang. They had everything to prove, considering the one and only time the band has ever cancelled a show was their last time in Phoenix. I think the audience forgave them after their killer performance of “Life is Beautiful.” However, the peak of the music was when they debuted their new song “We Will Not Go Quietly” from their unreleased album Prayers For the Blessed Vol. II which is scheduled to drop on November 18. Needless to say, the fans went nuts. Between acts, a giant curtain with Shinedown’s “S” covered the stage, hiding the setup and sound check from the audience. That is, until the first shredding guitar riff of ‘Adrenaline’ echoed out to a screaming crowd and the curtain dropped. Brent Smith (lead vocals), Zach Myers (Guitar), Eric Bass (Bass and Piano), and Barry Kerch (Drums) were jamming before the fabric fully hit the floor; and the crowd rose to their level in no-time. The energy in the room was a constant build-up, the audience off the band and vice versa. The music was amazing. True rock and roll, hard and strong. They draw influence from everything from Alice in Chains to Godsmack, to create a powerful anthem-rock sound on their fifth album “Threat to Survival,” which the tour is named for. The arena was filled with the sound of cheering and an army off-key voices singing along. Nobody cared and it was beautiful. While the music was great, there was so much more to the show. First, an incredibly complicated and diverse lighting set perfectly complemented the mood of each song. Pulsing strobes and lighting built into the drummers stand. Second, the pyrotechnics. 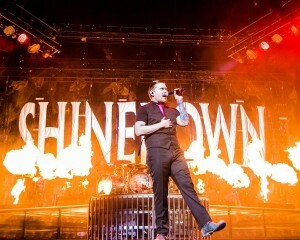 That’s right folks, Shinedown lit up the night, literally. Bursts of flame erupted from the stage, almost like miniature atom bombs in every color from orange to green. Not to mention the indoor fireworks. They promised a show to remember, and it’s one I won’t soon forget. 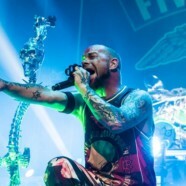 After a thirty-minute intermission, Five Finger Death Punch took the stage. 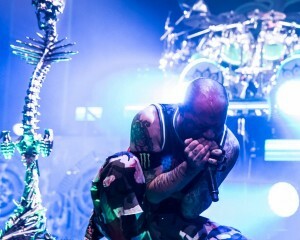 Lead vocalist Ivan L. Moody lived in Arizona for several years, and he said it feels like “a second home.” It was a special show for him, which made it that much better for the fans. The black-clad, long-nailed crowd with beer-in-hand had no objections. They ate it up, screaming for more. Alongside Moody, Jason Hook (Lead Guitar) Zoltan Bathory (Rhythm Guitar), Jeremy Spencer (Drums), and Chris Kael (Bass) shook up the arena. Heavy metal has a way of getting to people, especially in the pit. Various mosh pits broke out; at one point, there were even two at once. That is until they merged into one super mosh during “Burn MF” after the encouragement of Moody. The band even took the precaution of inviting all the members of the pit under the age of 15 onto the stage with them to prevent them from getting hurt. Turns out, metal-heads have soft hearts. At one point during the show, Moody even brought his family, including his two daughters, into the spotlight with him for the song “Wrong Side of Heaven”. While Shinedown had pyrotechnics and fireworks, FFDP had one of the best laser light shows I’ve ever seen. It was dynamic and colorful, filling up every ounce of space in the arena. The audience was enraptured, watching the beams cut through the darkness. Every beam was synchronized with the strong, almost tribal drum beat to bring a visual to the sound. An incredible, full sensory experience.